1) Body Life engenders Mutual Trust. People must trust you to have their best interests at heart and you must trust them to be a part of the change process. If you were to look through a list of the “one another” commands of Scripture you would find actions and reactions that would so govern the change process that people would not feel as threatened by it. Many of the fears associated with change would be alleviated. Don’t wait until it is time to make changes to try to promote this kind of atmosphere. Trust is something that is built over time. Which of these “one anothers” do you need to work at as a leader with members of the body, not just your ministry team? 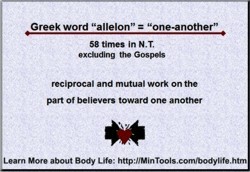 What can you do to promote these “one another” commands among the whole body? 2) Body Life requires the Participation of Others in the change process. Since body life is based on interdependence, it is therefore necessary to seek the input of others ideally at every stage but at least for some of the process. — before: How should we change? When you seek their help in the beginning, it will tend to build greater ownership of the change. — during: How should we implement the change? When you let them work on the strategy for changing, it tends to build greater cooperation as you begin to implement the change. — after: How well did we manage change? How has the change improved the way we do ministry? When you involve them in the evaluation stage, it tends to build greater investment for future changes. Let’s Learn from One Another: Look back at the list of “one another” commands listed above. Pick one of the commands and share how you, as a leader, have learned the value of that kind of mutual, reciprocal practice in affecting change. Perhaps you had to learn the lesson the hard way. One of women in our church has natural reactionary tendency to any kind of change. I’m talking about really not good reactions. I find that bearing with her, patiently hearing her out, she eventually comes around and is then one of my biggest supporters. Thank you, Pst. Doug, for that good example of what can happen when we bear with one another. God gave us these one another commands because they work to build understanding and unity. ← Previous Previous post: Budget Reflect the Great Commission?